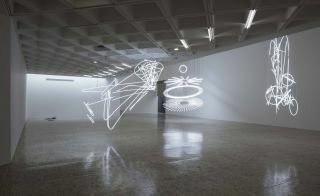 Full-blown colour, scintillating optical effects and dynamic movement, both real and implied, seem out of sync with the strong doses of gritty reality and intellectually weighty artistic investigations that typically greet visitors at contemporary art museums. 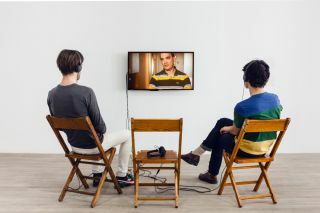 But with a title like ‘Happy Together’, which reprises the name of that sunny 1960s Turtles hit song, what would such an exhibition really have to offer? Would it be built around some vapid dreamy vision of the past, perhaps evoking flower power and values linked to notions of peace and love? As it turns out ‘Happy Together’ is kind of dreamy and the flowers do play an important role, but the work also points to some serious issues. Thing is, they are not so obvious and can easily be overlooked. 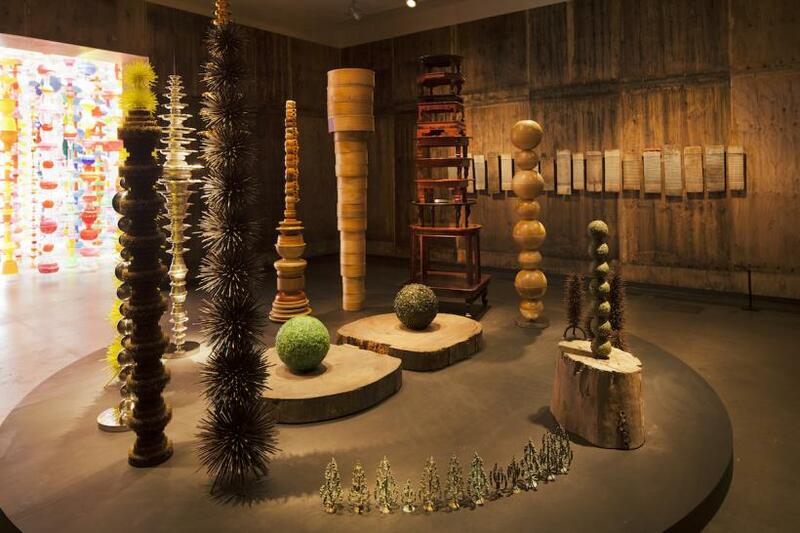 Choi, in fact, drops the viewer into a sequence of visions that connects the past and present, intertwines the natural with the synthetic, and speaks of life and death. 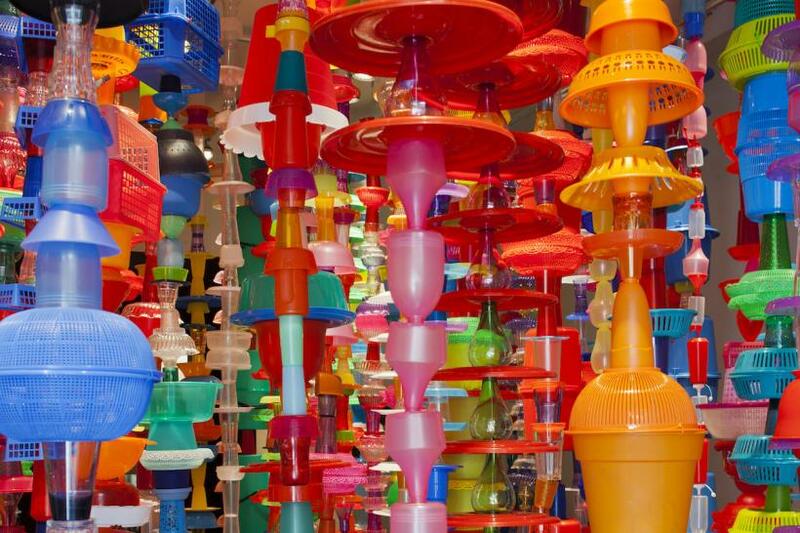 His installations are primarily composed out of materials with little monetary value, such as old cast offs, assorted recycled materials, and shiny new kitchenware. Though a lot of the stuff he uses is made of plastic, metal, glass, wood and textile elements can also within his panoramas. For example, he pairs mass-produced commodities with one-of-a-kind handcrafted items to create provocative juxtapositions. Whereas the former glistens with a fresh-out-of-the-package crispness, the lack of engineering evident in the latter highlights the touch of its maker. He can also address differences, such as those of class, in a very surreptitious manner. Take his use of crushed bottle glass in ‘Presence of Eternity’ (2013-2016), for instance. The green glass derives from the popular and inexpensive Korean soju liquor; the black from bottles holding Dom Perignon champagne. Movement through Choi’s series of installations subjects the viewer through a constantly shifting set of spaces. Depending at which end one starts, the journey either takes one from light to dark settings or vice versa. 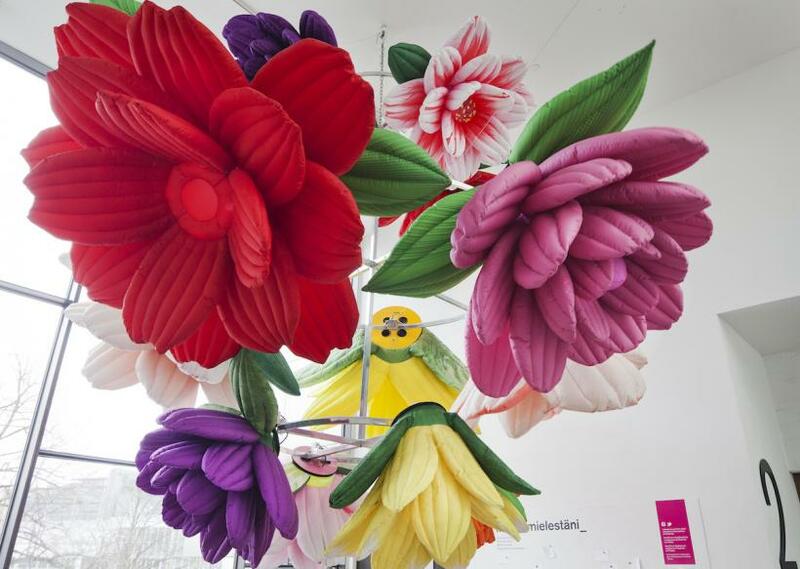 ‘Flower Chandelier’ (2012), a suspended kinetic sculpture that animates the area just over the museum’s entrance forms one such point. 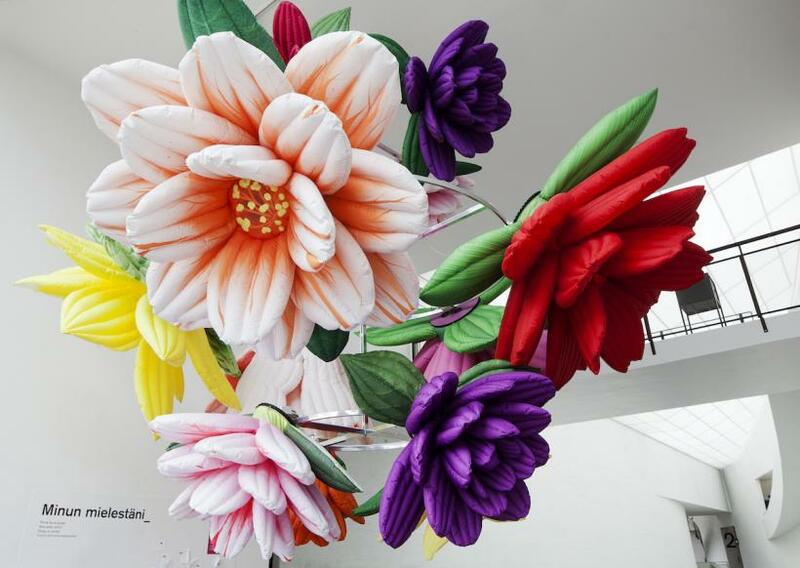 It can be seen from inside and outside the museum and its massive inflating/deflating flowers protract expressions of wonderment, and laughter. Occupying the opposite end is a blackened room harbouring ‘The Open Flower’ (2014). 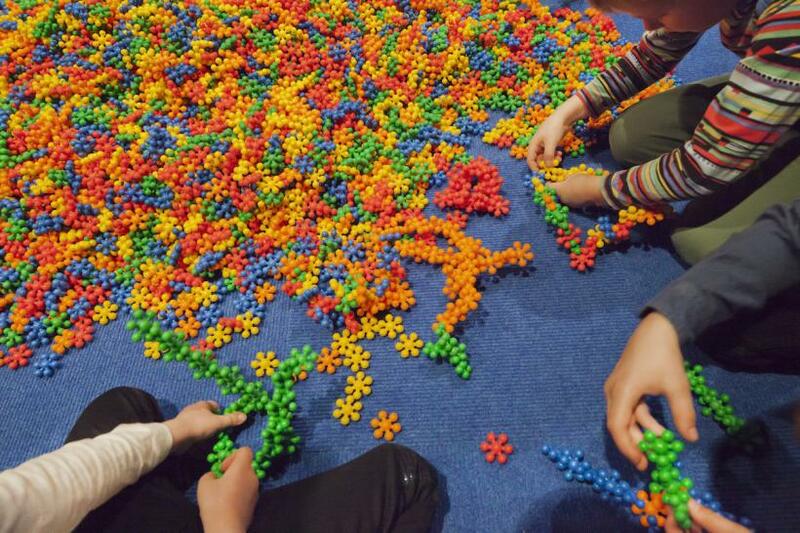 The brightly coloured interlocking blocks that cover its floor invite viewers to produce their own sculptures. 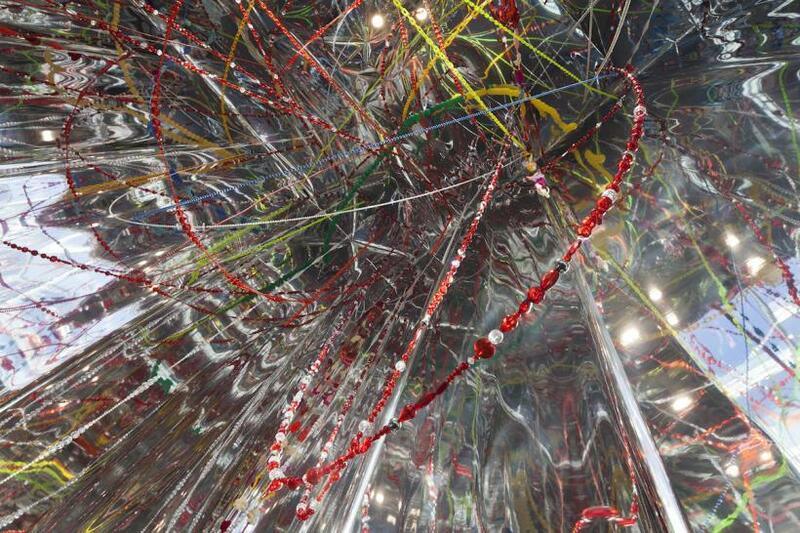 In contrast to the responses drawn out by the chandelier, this work induces concentration. People crawl about seeking out a particular colour or sit quietly snapping pieces together. In this hushed environment the topography is subject to ongoing transformation. 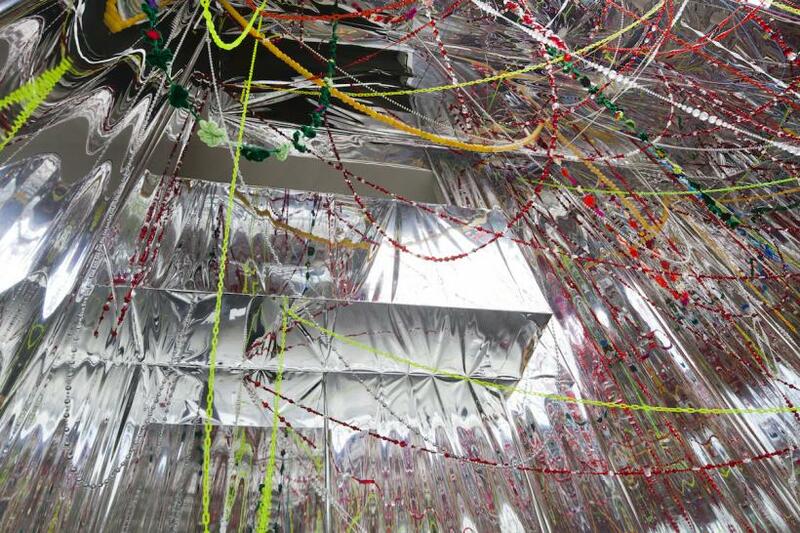 Between these extremes we find a high mirrored room, the upper echelons of which are studded with a prismatic array of garlands made of strings of beads, plastic chains and crocheted flowers. ‘Cosmos (We Are All Flowers)’ (2014) seems to stretch into oblivion and, in doing so, brings about a liberated feeling, even a tacit sense of weightlessness. 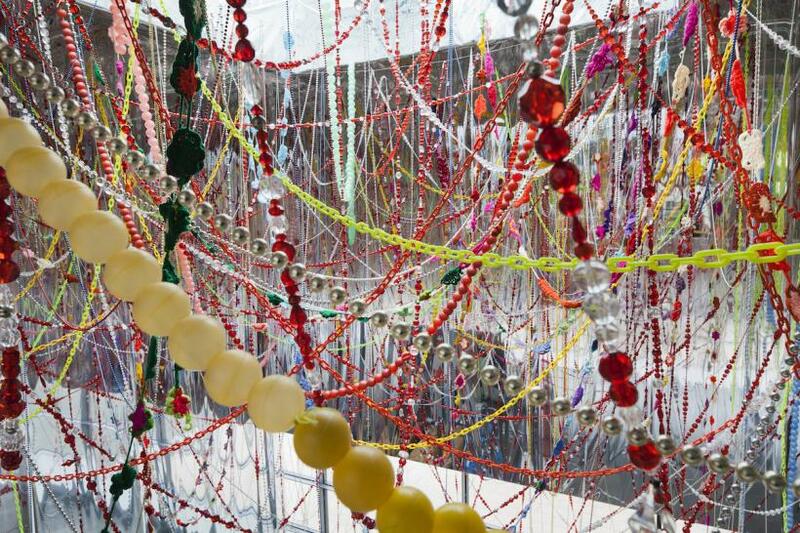 Strings of suspended objects also feature in ‘Happy Happy’ (2015). 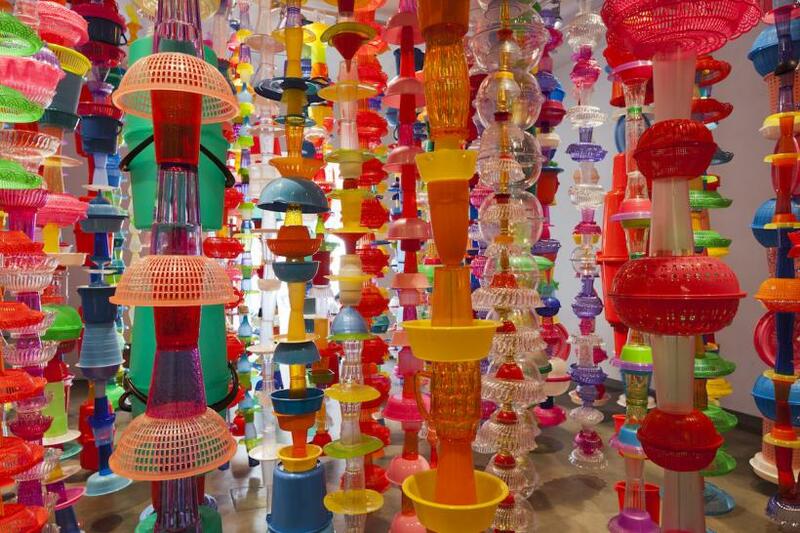 Here, the vertical stacks of household goods both recall and upend Brancusi’s ‘Endless Column’. 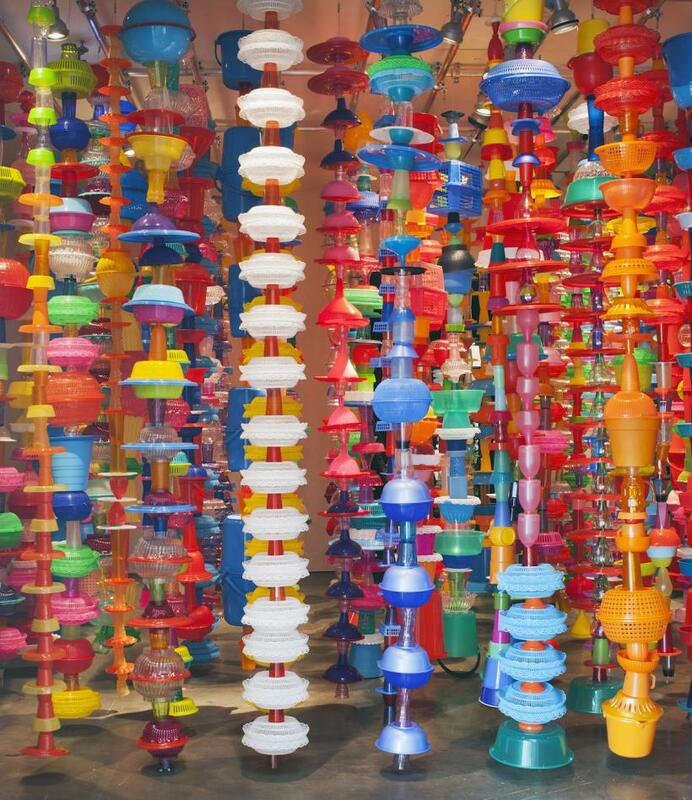 The richly dense interplay of shapes and colours offers candy for the eyes and propels visitors to explore the work’s maze-like character. 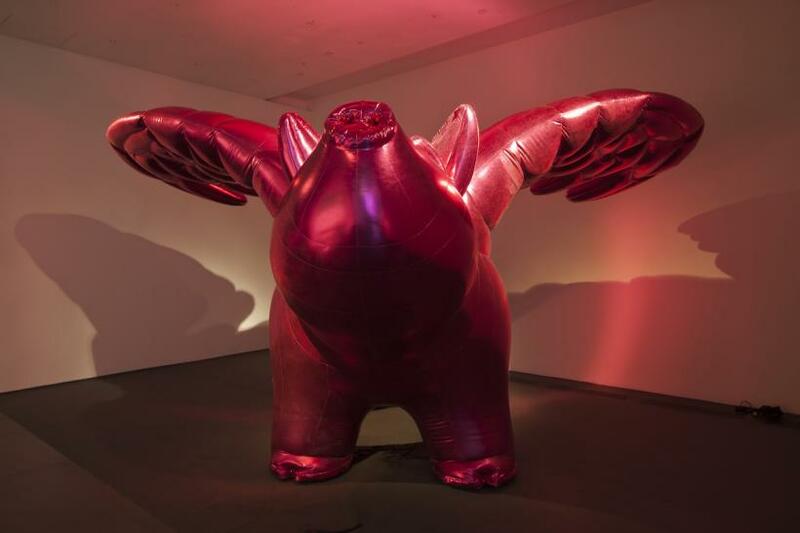 With the inflatable ‘Love Me’ (2013), a glitzy winged pig whose meagre lunges never get him off the ground, Choi riffs off Jeff Koons. 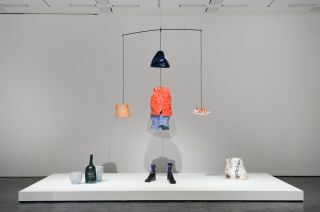 For Choi, this ineffectual bloated creature – a good luck symbol in some cultures and one of abhorrence in others – relates back to 1980s consumerism. For me, the most richly complex and memorable composition is ‘Presence of Eternity’, a work situated in a solemn wood-lined cave of a space. 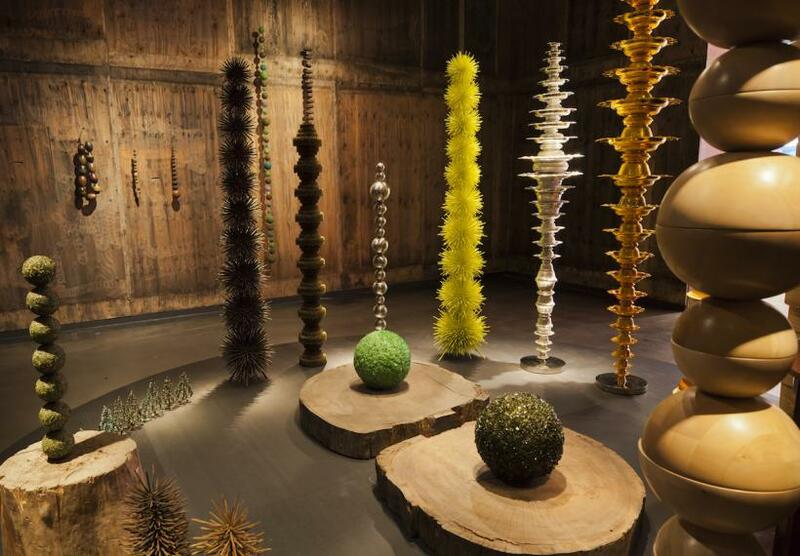 This collection of erratic cacti – or are they stalagmites? – intermingles organic and mineral constituents to create a stunning mix of lusterless hues and sparkling surfaces. Here worn, patinated and corroded skins co-exist with stacked spiny orbs and the unflinching hardness of stone and polished metal. The circular central arrangement and tonal harmony not only reinforce this sense of co-existence, but also propose an impression of interdependency. So finely tuned is its presentation that it is difficult to imagine a truncated version. Ultimately it seems that, of all Choi Jeong Hwa works, this one comes closest to defining the true essence of ‘Happy Together’.